The Peak District Challenge is an individual or team, walking or running event. It takes place on the night of Friday 20 September and the day of Saturday 21 September 2019, starting in Hathersage at postcode S32 1DU. Logistics: All events start and finish at Hathersage at postcode S32 1DU. The Back Before Dark 10km event takes place on Saturday evening. You will start running at 6.07pm and are aiming to finish before 7.07pm in order to be Back Before Dark. A stew supper is available at £4 for Back Before Dark 10km runners, alternatively Hathersage boasts several excellent eateries to refuel after your run. If you would like a more leisurely 10km walk you can start walking at 4.07pm on the Back Before Dark challenge. All other routes (from 25-100km) finish on Saturday evening and are served a stew supper (included in your entry fee). The Copper Challenge starts at 9.30am (wave 1) or 10.30am (wave 2) on Saturday, so the 9 hour finishing target is 6.30pm or 7.30pm. You can decide on the day which wave you’d like to join. The Bronze Challenge starts at 7.30am (wave 1) or 8.30am (wave 2) on Saturday, so the 12 hour finishing target is at 7.30pm or 8.30pm. You can decide on the day which wave you’d like to join. The Silver and Gold Ultra routes start at 9.00pm on Friday evening, 20 September 2019, so their 24 hour finishing target is 9.00pm on Saturday 21 September 2019. 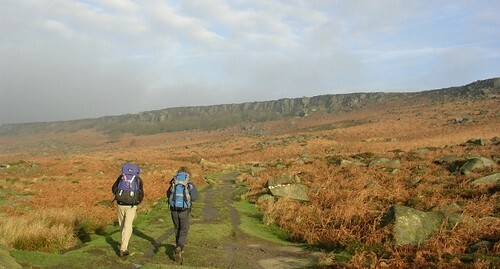 Participants and their supporters are also encouraged to spend the night in Hathersage at any of the local accommodation and take advantage of the local facilities and our celebration day on Sun 22 September 2019 before heading home the next day. Teams or solo entrants: The Peak District Challenge is a team event and you are encouraged to enter is a team of 3-5 people. Solo entrants are welcomed to the Back Before Dark 10km run. On the longer (25-100km) challenges, experienced and competent solo or duo competitors are allowed if they can show extensive walking and navigation experience at the time of registering. The event organiser, Wilderness Development regularly runs navigation training courses. Entrants are not permitted any additional external support, eg pace runners or additional personal crews. Entrants are encouraged to come in fancy dress, but it is not obligatory. Navigate yourself or join a led group Only the 10km Back Before Dark route is flagged on the ground, on all other routes (25-100km) you’ll be met by volunteers only at checkpoints. You have the option of navigating yourself around the challenge route, or joining a led group with a qualified Mountain Leader from Wilderness Development. Mountain Leaders will lead groups on the Copper and Bronze challenges, and overnight section of the Silver challenge taking care of your navigation and safety on the hill. Silver challengers must navigate themselves during daylight hours, and Gold Ultra challengers must self-navigate throughout. We publish more advice on “What level of navigation or map-reading ability do I need?” in our FAQs. Entry fee The entry fee reflects the real cost of putting on an event to professional standards: an honest £19-69 per person (depending on distance chosen). You can chose to fundraise for the event’s charity partner S.A.L.V.E. International (and receive a discount on your entry fee), or to fundraiser for another charity and pay your own entry fee. If you prefer not to seek sponsorship, there is a one-off surcharge (min £10) which is given in it’s entirety as a donation to S.A.L.V.E. International. Electronic event timing, and live tracking for your supporters to monitor your progress in real time. On 25-100km routes, drinks and snacks from our friendly volunteer checkpoints on the way round. On 25-100km routes, a stew supper on Saturday evening. A cash discount voucher to spend with the event organiser, Wilderness Development. This can even be redeemed in advance on any navigation training or walking courses that you take to prepare for the event. 21-year-olds + can enter as solo entrants. 16-17 year olds must be accompanied by their parent or legal guardian, or join a led group with a guide, they are not permitted as solo entrants. 12 – 15 year olds are permitted as part of a led group, but not in self-navigating teams. They must be accompanied by their parent or legal guardian. 18+ can enter as solo and/or self-navigating entrants. 12 – 17 year olds must be accompanied by their parent or legal guardian. 12-17 year olds are not permitted as solo entrants. 18+ can enter as solo entrants.